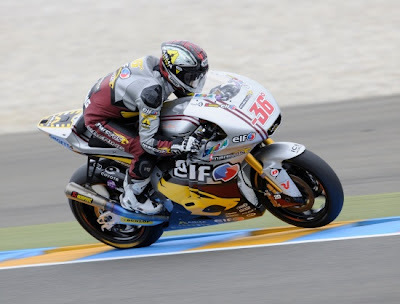 Good performances of Mika Kallio at Le Mans puts him on 5th place. Kallio was in contention for the top five throughout the 26-lap encounter and he expertly maintained a fast and consistent pace, despite encountering rear grip issues at the rain-soaked Bugatti track. He dropped back into a group of five riders battling for fifth, but a fantastic late attack saw him leave title contender Pol Espargaro, Bradley Smith, Julian Simon and wet weather specialist Anthony West trailing in his wake. Kallio said, “I’ve got to be satisfied with fifth and my best result of the season because it was so easy to make an error and crash. I was fast and able to stay with the leading group at the start, but once they picked up the pace I was unable to go with them without taking too many risks. I didn’t have the rear grip so when I released the front brake at the apex of the corner, I had to be very careful getting back on the throttle. That was costing me some time and each time I pushed I almost crashed."